"The day had been a most unfortunate one for us…"
Colonel Charles Shiels Wainwright enlisted in the First New York Artillery in 1861. Though having had some experience in the New York State militia, the army was a novel experience. Wainwright enthusiastically threw himself into his role as major of the regiment. That fall he purchased a journal to record his experiences during the war, both in camp and on the battlefield. They remain as one of the finest accounts of life as a Civil War soldier and of the war experienced from the saddle. The first day of the battle was marked by a lack of coordination by Union commanders. The mobile Wainwright was in several areas during the fighting and left a blunt and almost amusing account of the difficulty the Union commanders faced in the fields west of Gettysburg. This is his story from A Diary of Battle, The Personal Journals of Colonel Charles S. Wainwright, 1861-1865, edited by Allan Nevins. "July 1, 1863, Wednesday: We breakfasted soon after sunrise, but it rather promised then to be a quiet day for us. I was just finishing up my monthly return when the order came to move at once. The order was from (General Abner) Doubleday, and placed the Third Division on the lead, and the First at the rear. So soon as my command had hauled out, as they had to wait for the Third Division in rear of which they were to march, I rode on ahead to learn what I could as to the prospects of a fight. I saw General Reynolds, who said that he did not expect any; that we were only moving up so as to be within supporting distance to (General John) Buford, who was to push out farther. At the corners where Reynolds had his headquarters the Third Division was turned off by him on a road to the left. General Reynolds then rode on, and took the First Division ahead with Hall's (2nd Maine) battery, which being camped near three miles in advance had an hour's start ahead of us. We moved along very quietly without dreaming of a fight, and fully expecting to be comfortably in camp by noon. So confident of this was I that, for the first time, I threw my saddlebags into the wagon, and was thus left without my supply of chocolate and tobacco, without brush, comb, or clean handkerchief. My horse 'Billy' cast two shoes on the road. I had no hesitation on stopping at a farmhouse with one of my forges until they could be replaced and even sat there ten for fifteen minutes longer until a heavy shower was over. I then rode up to the head of my brigade, where I found General Doubleday. 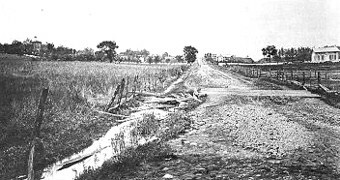 "This was about two miles before coming to Gettysburg and between ten-thirty and eleven o'clock. We were just speaking of General Meade's promotion and Doubleday was just saying that Sykes was his junior, and they ought to give him a corps, when my attention was called to the smoke of shells bursting in the air. On listening we could hear the sound of cannon apparently some three or four miles off, which we supposed to be from Buford's cavalry. In a few minutes, however, an officer... came up with orders for us to push on as fast as possible, as Reynolds was engaged over beyond the seminary. "I at once started my three batteries, Reynolds leading, and after going along the road about half a mile turned in to the fields on the left, where I saw that other troops had gone, and which took me directly towards the seminary. Halfway there I met Craig Wadsworth, who merely said, 'The General is killed; Reynolds is dead.' Shortly after I met his body being brought off. I halted and uncovered as he passed; it was all there was time for. All I could do then was put my batteries in a position where they could be got at easily, have them send their battery wagons and forges to the rear, and wait in condition to start at a trot the instant orders came. I then rode along the ridge on which the seminary stands, and afterwards out to the one beyond. The ridge... is wider and much more rolling; the greater part of it is cleared. Just where the Cashtown Pike crosses it there stands a large farmhouse and barns, with an orchard to the left of it, and then some six or eight acres of wood. It was here that General Reynolds was killed by a minie ball through the head. He fell from his horse and expired instantly. I did not like this advanced position at all, its right flank being exposed to a high ridge to the north and approached by a number of ravines which afforded excellent cover to an attacking party. General Wadsworth had ordered Hall (2nd Maine Battery) back again, but I took the responsibility of forbidding him to put his battery there until I knew there were troops to cover his right flank. "Passing then to the right of the railroad cut, on to the wooded knoll, I found that it had just been occupied by Robinson's division and Cutler's brigade. The lay of the ground was very intricate, so that it took me some time to make out the disposition of our troops; which proved to be all sorts of ways. As I was coming out I saw a line of rebels advancing towards Cutler's flank, and rode back to tell him, as I had no one with me… As I came out again I saw a portion of the Eleventh Corps moving forward in line facing north, so that the two corps formed a right angle at the knoll where Robinson was. They had two batteries with them which were just opening fire. Having thus made myself well acquainted with the ground and as far as possible with the dispositions of the troops, I rode to report to Gen'l Doubleday. "Somewhere around three o'clock… a long column of rebels came out of the wood a mile or so in our front and filed off to our left. This was soon joined by another column, which when they faced into line formed a second line for them. They marched along quietly and with confidence, but swiftly. I watched them from the battery and am confident that when they advanced they outflanked us at least half a mile on our left. So soon as they were within range I opened on them with the four guns (Battery L, 1st New York), but a brigade of the Third Division sent to support the battery persisted in getting in front- that being the commander's idea of supporting. The rebel lines advanced rapidly. There was not the shadow of a chance of our holding this ridge even had our Third Division commanders had any idea of what to do with their men… I therefore soon ordered Lieutenant Bower to take his four guns back to the Seminary Ridge, to the position he had previously occupied about a hundred yards south of the college. "While I was with General Doubleday, one of Howard's German aides rode up, and told him that General Hancock, who succeeded Reynolds in command of the two corps, wished that the Cemetery Hill should be held at all hazards. What with the aide's broken English and our being on this hill and not knowing that there was a cemetery, I thought it was the Seminary Hill we were to hold. I had therefore strung my batteries out on it as well as I could, only having four now. Wadsworth's division was falling back…, the rebs pushing rapidly on and cheering. They were also attacking the Eleventh Corps at the same time. The Cashtown Road being our most important point, each one had aimed to take care of it. Robinson had ordered Stewart (Battery B, 4th US) to take post on each side of the railroad. Doubleday had ordered Stevens (Battery E, 5th Maine Artillery) from where I had placed him at the left to the road itself. Cooper (Battery B, 1st Pennsylvania) had his four guns immediately in front of the main building… Thus there eighteen pieces on a frontage of not over two hundred yards. But there was no time to make changes, for the rebs were coming steadily on down the ridge in front only five hundred yards off and all the guns were blazing away at them as lively as possible. In a little time I went to the right and front of (Lieutenant) Wilbur's section, one piece of which was on the Cashtown Road. I found Lieutenant Davison had thrown his half of Battery 'B' around so as to get an oblique, almost enfilading fire on the rebel lines. His round shot, together with the canister poured in from all other guns, was cutting great gaps in the front line of the enemy. But still they came on, the gaps being closed by regiments from the second line, and this again filled up a third column which was coming over the hill. Never have I seen such a charge. Not a man seemed to falter. Lee may well be proud of his infantry; I wish ours was equal up to it. 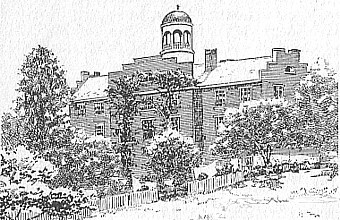 "When I returned (to the seminary), I found the Fifth Maine limbering up. I stopped them, when Lieutenant Whitaker told me that General Wadsworth had said they had better withdraw. Remembering what I had supposed to be Howard's order to hold Seminary Hill to the last, I had no notion of going off, and rode around to see that none of the guns moved. An officer now informed me that a rebel line was advancing on our right. Looking at it, I was sure that it was the Eleventh Corps, and could not be convinced to the contrary until they opened fire on a portion of that corps which I could now see making for the town. I then at once ordered all to limber up and move at a walk towards the town. I would not allow them to trot for fear of creating a panic. But I had very little hope for getting them all off, for the rebs were close upon us; so near that a big fellow had planted the colors of his regiment on a pile of rails within fifty yards of the muzzles of Cooper's gun at the moment he received his order to limber up. As I sat on the hill watching my pieces file past and cautioning each one not to trot, there was not a doubt in my mind but that I should go to Richmond. Each minute I expected to hear the order to surrender for our infantry had all gone from around me, and there was nothing to stop the advancing line. Just as the last of Stewart's caissons was coming into the road, a number of the enemy's skirmishers, sweeping around the south side of the college buildings, opened fire across the road at about fifty yards distance. Our infantry did not return the fire, so there seemed no chance but what they would kill all my horses. Perhaps, though, it was well for me that our infantry instead of making fight took at once and in a body to the left, over the railroad… embankment. This cleared the road and I shouted, 'Trot! Gallop!' as loud as I could. It did not take long for the whole eighteen pieces and six caissons to be in full gallop down the road, which being wide allowed them to go three abreast. As I saw the head carriages already at the turn of the road just before entering the town, I felt that now all were safe. And my next duty being to look out a new position for them I galloped to the front. In order to get by the batteries I was obliged to climb over the railroad and enter the town by another street. "I had hurrahed a little before I was out of the woods. The rebs pulled off the skirt of my coat; that is, after I left the road they got some pieces on the crest we had just left, and fired into the tail of our column, smashing up three of Stewart's caissons. The rascals south of the road, too, killed the off-wheeler of Lieutenant Wilbur's last piece; and when he had just got him cut out and was starting again, they shot down three more horses, his own horse, and one of the drivers. So the gun was abandoned. I was terribly grieved when I heard of it, for I had begun to look upon our getting off from that place as quite a feat and wished that it could have been without the loss of a gun. The more I think of it, the more I wonder that we got off at all. "The streets of the town were full of the troops of two corps. There was very little order amongst them save the Eleventh took one side of the street and we the other; brigades and divisions were pretty well mixed up. Still the men were not panic stricken; most of them were talking and joking. As I pushed through… to the top of Cemetery hill, the existence of which I now learned for the very first time. I reached the top of the hill almost as soon as my first battery. Here I found General Howard who expressed pleasure at seeing me and desired me to take charge of all the artillery, and make the best disposition I could of it..."
Colonel Wainwright played a key role in placement of his exhausted batteries around Cemetery Hill and experienced several narrow escapes from harm over the next two days of bitter fighting at Gettysburg. The following spring, he commanded artillery in the Wilderness Campaign and was active during the Siege of Petersburg, the subsequent campaign to Appomattox Court House, and the Grand Review in Washington. After the war, Wainwright's activities are not as well documented. He remained in military service for a while, attaining the rank of general. He lived in New York, Europe, and finally settled in Washington, DC, where he was incapacitated with blindness and after effects of malaria. He finally applied for a pension in 1902. Charles Wainwright died in 1907 and was buried in New York. But Wainwright's entries go beyond military matters to include his political and social observations. Skillfully edited by Allan Nevins, historian and author of the classic multi-volume Ordeal of the Union, this journal is Wainwright's vivid and invaluable gift to posterity. The effects were telling. This book is an artillery 'buff's' delight...The work meticulously examines the forming of the respective artillery arms of the two armies; the organization; artillery technology; guns; equipment and animals constituting that arm; ammunition; artillery operations; the artillerymen and, finally, actions of the guns on July 2 and 3....The work is perfect for someone seeking more data than found in most general histories of the battle...Nicely illustrated to supplement the text, the succinctly written technical details of ballistics, projectile composition and impact of technology for battlefield lethality will prove similarly useful and exciting for anyone captivated by the guns of Gettysburg. Cole explains the benefits and liabilities of each piece of artillery....His use of photographs, diagrams, and maps are excellent and integrate seamlessly into the text....Not only does it explain why events unfolded the way they did , it helps explain how they unfolded. No other modern book on Civil War artillery of this size is as detailed...as this book is generally...The author's broad approach to the whole subject of artillery tactics shine when he compares and contrasts several artillery incidents at Gettysburg that better explain what was going on at the time....This book is essential for all those interested in Civil War artillery, 19th century artillery, or just the battle of Gettysburg. I found Civil War Artillery at Gettysburg to be an informative and well written account of the 'long-arm' at Gettysburg. The book is very well-illustrated with maps and photos throughout. I thoroughly enjoyed this book and highly recommend it. The amazing part is how much the author has fit between a mere 72 pages. This work is very inexpensive and should prove useful to anyone touring Civil War battlefields, interested in Civil War gaming, reenacting, or curious about civil war cannons.